A Year of Being Here: David Watts: "Fragment at the Beginning of Something..."
David Watts: "Fragment at the Beginning of Something..."
and he will go on, gathering. in the long, resilient mornings. "Fragment at the Beginning of Something..." by David Watts, from Bedside Manners: One Doctor's Reflections on the Oddly Intimate Encounters Between Patient and Healer. © Random House/Harmony Books, 2005. Presented here by poet submission. 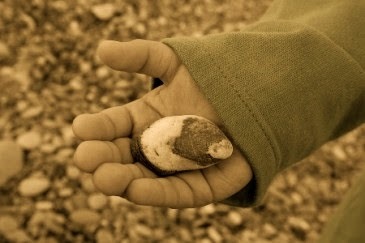 Art credit: "Cloudy stone, rounded by the sea, on a palm of a child," photograph uploaded by Profe (originally color). this one's a favorite! Thank you for choosing it today.